The Co-ordinator, Centre for Gandhian studies, University of Kerala, India. He has done PhD in Gandhian thought, Annamalai University, Tamil Nadu, India. His topic for PhD was "A critical study of the Gandhian Movement with special reference to Gandhi Peace Foundation". He has been a Gen. Secretary, fellowship of friends of Truth, Gandhigram, Rural University during 1987-89. Doctorate in Gandhian philosophy, experienced, Gandhian scholar, travelled extensively world wide. Gandhian scholar turned human rights activist Nelakanta Radhakrishnan is founder of G. Ramachandran Institute of Nonviolence of Thiruvanthapuram (Kerala, India), Gandhi Media Centre( New Delhi & Madurai). He is also the General Secretary of Indian Council for Gandhian Studies (New Delhi) and National chair of citizens for Human Rights India. Author of over thirty books in English, Hindi, Tamil and Malayalam. Visiting Professor in over twenty Universities in different parts of the world. Winner of Gandhi-King-Ikeda Award (2001) & Honorary Ambassador of USA, Orange Country USA. Holds a doctorate degree from I. I. T. By profession is a civil Engineer. Since retirement have been involved with Gandhian Institutions and Gandhian studies, particularly on the subject of Political Economy, Attended a Gandhian conference in U. S. in October-1995 and international conference on Gandhian concept of freedom in University of Calgary, Canada in November-1997. He has visited Doda District and Kashmir Valley as a member of Gandhian groups for dialogue with the militant groups. Mumbai- 400 021, MH, India. Born at village Kakrauli of Muzaffarnagar District (U. P.), India DR. RAVINDRA KUMAR (M.A. Political Science & Philosophy, PGD in Gandhian Studies and Ph. D. in Political Science) is an eminent Writer, Thinker, Scholar, Political Scientist, Peace Worker and Educationist, who has authored/edited more than 100 works on great personalities of the Indian Sub-Continent including Mahatma Gandhi, and on various social, religious, political, historical, educational and cultural issues. 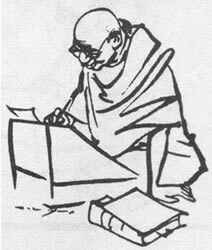 Some of his works, of which many are of international repute and have been translated into Marathi, Tamil and Thai languages apart from Hindi and English languages include ‘MORALITY & ETHICS IN PUBLIC LIFE’ (1999, ‘RELIGION AND WORLD PEACE’ (1999-2006), ‘GANDHI AND GANDHISM’, PART-FIRST (2001), ‘CHAMPARAN TO QUIT INDIA MOVEMENT’ (2002), ‘THEORY AND PRACTICE OF GANDHIAN NON-VIOLENCE’ (2002), ‘NON-VIOLENCE AND ITS PHILOSOPHY’ (2003), ‘FIVE THOUSAND YEARS OF INDIAN CULTURE’ (2003), ‘TOWARDS PEACE’ (2003), ‘MAHATMA GANDHI AT THE CLOSE OF TWENTIETH CENTURY’ (2004) ‘GANDHIAN THOUGHTS: AN OVERVIEW’ (2006), ‘MAHATMA GANDHI IN THE BEGINNING OF TWENTY- FIRST CENTURY’ (2006) etc. A noted Indologist and the Former Vice-Chancellor of the C. C. S. University, Meerut, India, DR. RAVINDRA KUMAR has been associated with a number of national and international academic, cultural, educational, social and peace organizations / institutions. DR. RAVINDRA KUMAR’S works contribute significantly for bringing about reconciliation among social groups, religious communities and sects. They focus on equality, humanism, integration, international understanding, non-violence, social change, unity and global peace. Program Officer / Head of Office - Doordarshan, Thrissur - 10, Kerala. Also a visiting faculty at film and Television Institute of India, Pune.